Now I’ve seen the Billy Walton Band in a variety of venues including village halls, rugby clubs and even the occasional music venue, but this was a first; BWB playing in a golf club in north London. First impressions were that, well, it was a golf club lounge with a temporary stage at one end and a bit of dance floor in front of it. None of that was going to put me off, because the venue’s almost irrelevant; these guys create their own live music bubble in any room they play. I think the band needs a name change as well; maybe the Ever-Expanding Billy Walton Band would work. The first time I saw the band (almost six years ago) they were a power trio – Billy, William Paris and drummer John Hummel. Since then, the brilliant John D’Angelo has taken over as the pulse behind the band and, after a brief spell with Richie Taz playing tenor sax, a horn section evolved adding tenor sax and trombone to the mix. The current BWB horn players are Tom Petracarro (sax) and Matt (Fish) Fisher (trombone); they add a huge soulful punch to the mix and they’re a whole bunch of fun as well. 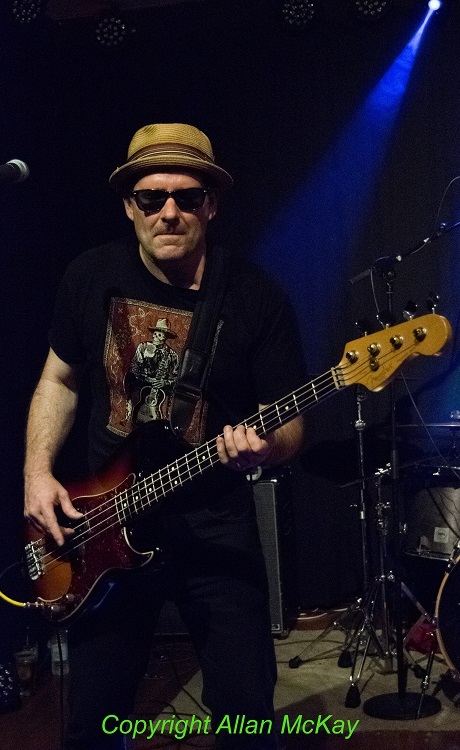 As of last year, Stateside keyboard collaborator Sam Sherman completed the six-piece line-up that is the current touring Billy Walton Band. So, back to Barnet. From the moment the band hit the stage, the audience was with them, waiting for the magic to begin. The impact of the augmented line-up is obvious from the start; as a three-piece, every fill and solo was Billy’s responsibility but now it’s spread out over another three players. There was a perfect demonstration of the power this adds to the band during their cover of the Creedence song “Green River” (and where did that come from? ), where the horns reinforced the guitar riff to create a punch that John Fogerty would be proud of. There’s another way that the band have moved on since 2010; the songs from the last two albums are much more commercial and the part of the audience that isn’t worshipping the phenomenal guitar playing can appreciate the quality of the newer songs, particularly “Till Tomorrow”, with its insanely catchy hook. You expect great guitar solos, but the horns and keys are featured as well, creating a bit of breathing space and a perfect setting for Billy’s phenomenal playing. The song “Hot Blues” normally features Billy’s guitar mash-up of various recognisable riffs (and maybe a quick burst of vocals) from various classic rock tunes, but it was extended even further in Barnet because of the Grim Reaper’s hyperactive January. The solo featured quick tributes to Bowie (“Ziggy Stardust”), Glenn Frey (“Life in the Fast Lane”) and Buffin (“All the Young Dudes”) as well as “Kashmir” and the usual suspects. I’m crossing my fingers here, but Billy seems to have hit on the line-up and the format to display his talents and appeal to a wider audience. There’s a perfect balance between strong songs, guitar virtuosity and the good time bar band playing soul, blues and rock that should push them up to the next level; I really hope it does. OK, I cheated with my favourite five photos by doubling it up to ten, but I think it was worth it. Following on from my all-female shortlist, here’s the (mostly) male version with photos from a wide variety of musical styles and some very interesting venues. If you’re interested in the running order for these, it’s really simple; it’s chronological. 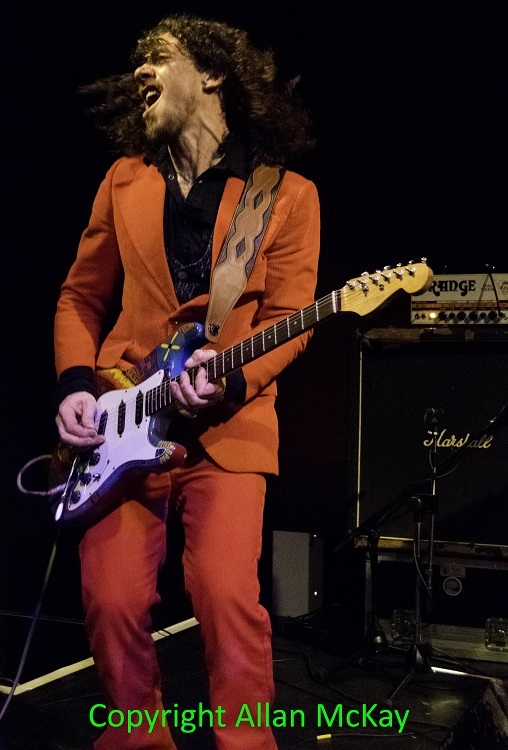 John Fairhurst at Rich Mix, Shoreditch – I heard about John Fairhurst in 2014 when I reviewed his “Saltwater” album but had to wait until February 2015 to see him live. Rich Mix is a cultural oasis set between strip joints and banker pubs in Shoreditch. The venue features a wide range of musical styles and it has a really good lighting rig. John Fairhurst dressed for the part with a bright red suit and made the colour/black and white debate completely irrelevant. I could have picked any one of half a dozen shots from that gig for this set, but this one captures his onstage perpetual motion machine. Thanks to John and Fabio Suttle for setting this one up for me. William Paris (Billy Walton Band) at Hockley Community Centre, Essex – Another first-time venue in the middle of the Essex countryside where a few quid has been spent on decent stage lighting. The Billy Walton Band always give good face, but this gig presented some interesting opportunities. As Billy led the horns on a Pied Piper dance around the room, the rhythm section were left on stage with no guitars, saxes or trombones in the way and I had a great opportunity to get a decent photo of the uber-cool bass player William Paris while the audience was looking the other way. The Vans at The O2 Academy Islington – Another gig that I went along to with my mate Jonesy because it was on his manor (sorry slipped into mockney again). This was one of those showcases that could have been brilliant or awful; it was 80% brilliant with a varied selection of bands and reasonable lighting. The Vans are Australian and play catchy melodic rock that you just have to like. 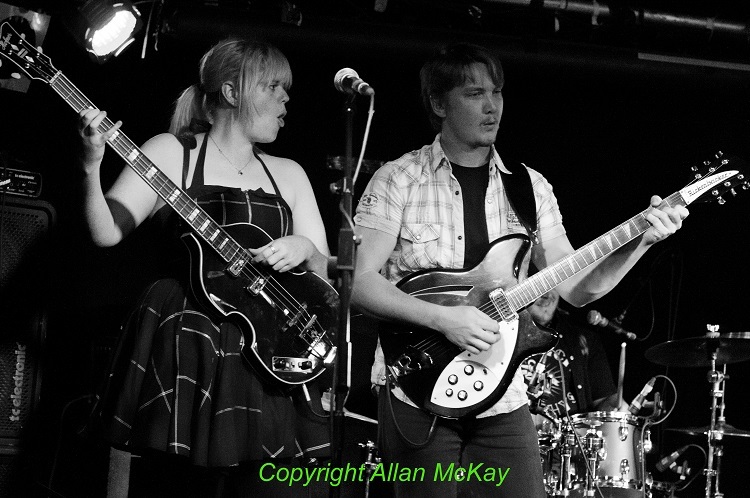 It took me a couple of songs to work out that there were some Fab Four parallels and I was lucky enough to grab this shot of Kat and Ryan that absolutely had to be black and white to catch that sixties feel. Laurent Mouflier at The Borderline – For the launch of his “Grio” album at The Borderline, Aidan Connell put together an interesting line-up which included Wang Dang Doodle opening the show. 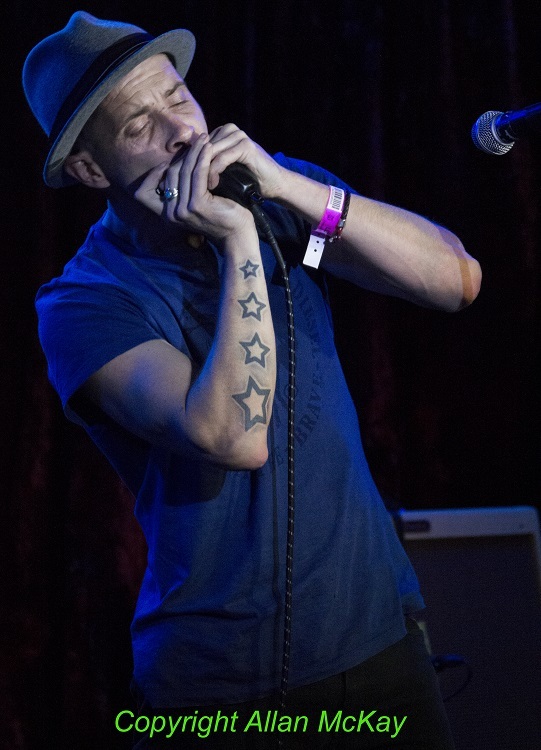 Laurent Mouflier, the band’s singer and harmonica player is always an interesting photographic subject, and my portfolio’s not exactly overflowing with shots of harmonica players. Lighting at The Borderline can be a bit hit and miss but, on this occasion, it was absolutely perfect as Laurent tilted his head back (eliminating any possibility of shadows from the brim of his hat) and blew up a storm. Possibly my favourite photo of the year. 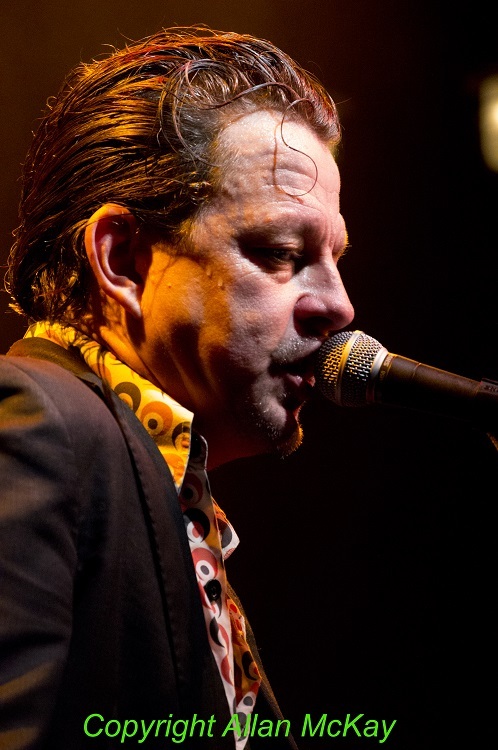 Ian Siegal at O2 Blues Fest – With a choice of pop-up venues scattered around the O2, lighting was always going to be a bit unpredictable, but Brooklyn Bowl has a permanent stage with a pretty good rig, so there would at least be opportunities for some decent shots. This was the second time I’d seen Ian Siegal and the first time with a band. After trying a few different angles, I moved in close and framed really tight, ignoring the guitar and concentrating on the face. It worked perfectly; this was one of those rare occasions when you know as soon the shutter release clicks that you’ve got the shot. And that’s definitely the end of the photos for this year. Bring on 2016. It’s unbelievable, really. We’re already halfway through 2015; how did that happen? Well, however it happened, there’s been an awful lot of it. At the start of the year, we made a few predictions about bands and artists to keep an eye on in 2015 and this seems like a pretty good time to have a look at how they’re getting on and maybe add a few more to the mix. So why don’t we start at the beginning because, apparently, that’s a very good place to start. The first of our hot picks to shake some action in 2015 was the Billy Walton Band with “Wish for what You Want”, their first release on American independent label Vizztone in February 2015 after a series of self-released albums. We’ve been watching Billy Walton live since 2010 and he’s been steadily edging up the rankings. The band’s increased in size as well, from a power trio to a six-piece on the latest UK tour and the addition of sax, trombone and keyboards has emphasised their awesome live power while allowing them to move in new directions. 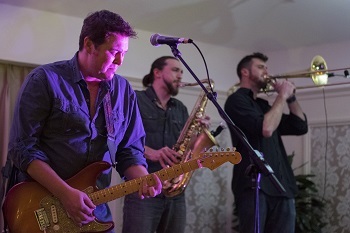 Like his fellow New Jersey artists Springsteen and Southside Johnny (Billy has toured as an Asbury Juke in the UK a couple of times), Billy’s fond of taking the show in unexpected directions and these guys are easily good enough to follow him. They should be back in the UK later in the year, so watch out for them in your area. Dean Owens is another artist the Riot Squad has been following for some time; well since the release of his 2012 album “New York Hummingbird” anyway. Dean has deservedly been acclaimed by those in the know (including Irvine Welsh) for some time now as a singer/songwriter but hasn’t ever managed to get the wider attention he really deserves; it looks like his 2015 album “Into the Sea” on Drumfire Records may have changed that. It’s generated a huge amount of media attention including a Bob Harris interview and live session for Radio 2 and an appearance on the cult BBC Radio Scotland football show “Off the Ball” presented by Stuart Cosgrove and Tam Cowan. The album’s probably his best yet with some highly personal lyrics and memorable melodies backed up by a great group of Nashville musicians. Next up was The Kennedys; Maura and Pete Kennedy are also from the East coast of the USA; New York City is their adopted home. They decided to celebrate their twentieth anniversary by releasing not one, not two, but three albums this year and to tour in support of the albums. Two of the albums have already been released, The Kennedys album “West” and Maura’s solo album (with lyrics from poet B.D. Love), “Villanelle” and they’re both exceptionally beautiful pieces of work. Still to come (in September) is Pete’s long-awaited solo piece “Heart of Gotham” a suite of songs inspired by New York City and its inhabitants. Pete’s poetic sensibilities, huge knowledge of the history of American music and quiet mastery of his instrument (or more accurately, instruments) make this another one to look out for. Well that’s the story so far, but there’s more to come later in the year. Stone Foundation were obviously on the way up in 2014 when we reviewed their album “To Find the Spirit”, but 2015 has seen them providing the title track for the wonderful short film “Beverley”, trekking across Europe, signing record deals in Japan and the USA and recording the superb “A Life Unlimited” album which is released in the UK on August 7 this year. There’s a UK tour to promote the album, followed by a Japanese tour and some festival appearances over the summer. Pre-sales on the album have been very impressive and this looks like the year that Stone Foundation finally become an overnight success. Keeping the faith seems to finally be paying dividends. So what’s been happening to the Billy Walton Band since the release of “Crank it Up” in 2012? Well, apart from the non-stop touring in the USA, Europe and the UK, the band has had a few line-up changes. Tenor sax player Rich Taskowitz has moved on and Billy has brought in Ian Gray (trombone) and Sean Marks (tenor and baritone sax) to fill out the band’s sound, moving away from a jazz set-up with two soloists to more conventional rock and soul lineup with frontman and backing horn section. It’s a slight change of emphasis, but it creates a more cohesive full-band sound underpinned by the rock-solid rhythm section of John D’Angelo (drums) and William Paris (bass). For their fourth studio album, “Wish for What You Want” (released in the USA on Vizztone on January 27), the band has enlisted the services of respected producer Tony Braunagel and keyboard player Mike Finnigan, plus a few special guests from New Jersey and the tweaks seem to have paid off. As you might expect from the Billy Walton Band, the album works across many styles and genres, featuring strong songs and the usual high quality arrangements and playing; oh, and a bit of fun as well. The album opens in a blast of horns and guitar with the uplifting rock and soul of “Wish for What You Want” and the first of many proper endings – none of your lazy fade-outs here and a standout track. “True Lovin’ Man” has a mid-tempo 70s feel, particularly in the horn arrangements before the blues stomper “Mountain” bursts in with a huge guitar riff. “Come on Up” is an organ-driven straight-ahead rocker, building up a head of steam before changing down a few gears for the country blues of “Blues Comes A Knockin’” featuring Southside Johnny on harmonica. “Forgive and Forget” takes the tempo straight back up again with the full band with organ and horns laying the foundation for Billy’s wah-wah guitar fills and solo. If the album gets a vinyl release, this is the perfect way to end Side One. “Change” is exactly that, a brooding, atmospheric piece which channels Sergio Leone through Ray Manzarek before breaking into the straightforward blues chugger, “Worried Blues”. The next three tracks are probably the most commercial songs on the album; “Till Tomorrow” is a reworking of a “Crank It Up” song which adds a piano intro and plays down the horn fills. It’s a great song with a perfect guitar hook and in earlier times it would have been a perfect choice for a single. “Walk that Little Girl Home” is a Willy de Ville cover which mixes early Springsteen with The Drifters to evoke the Jersey shore perfectly and create another of the album’s highlights. “It Don’t Matter” has an E Street Band–inspired intro leading in to a “Take Your Job and Shove It” lyric which might or might not be autobiographical; it also features a great sax solo from Joey Stann; another former Asbury Juke. The album’s final track, “Hudson County Star” is loose blues/rock workout poking fun at corruption in the New Jersey political scene (a wide target, to be fair) which gives William Paris his customary shot at a lead vocal. 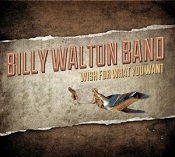 “Wish for What You Want” is another step forward for the Billy Walton Band. 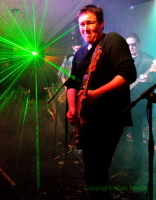 The band has evolved from the original power trio line-up focussing mainly on Billy’s guitar work to a rock and soul five-piece capable of covering a wide variety of styles. If you like your songs served up with big guitars and horns, then this one’s for you. If you decide that you like the album, then I’ve got a piece of advice for you; go out and watch the band live. You won’t regret it. Released January 27 2015 on Vizztone. If one of your favourite bands is about to record their fourth studio album, wouldn’t you like to have a peek inside the studio to see what’s going on? I certainly would. Well, the Billy Walton Band is about to go to work on their fourth studio album, which is being produced by legendary drummer Tony Braunagel with keyboard player Mike Finnigan helping to fill out the band’s sound, and the guys will be releasing video footage documenting the progress of the album (and probably lots of studio mayhem). If you’re a fan of the band, you can get links to these videos, as soon as they appear, here on MusicRiot. Make sure you don’t miss out; like our Facebook page and you’ll be notified as soon as the clips go live and we’ll tell you about all of the other great new music we’re reviewing as well. Does that sound good to you?